Aquatic Physical Therapy: Not just for Geriatrics anymore! Aquatic physical therapy refers to water-based exercises that are performed specifically to improve range of motion (ROM), muscle strength, and circulation, while decreasing swelling and pain. When the term “aquatic physical therapy” or “hydrotherapy” is heard, the first image that often comes to mind is a group of geriatric patients with arthritis in a pool using foam weights and foam pool noodles while marching in place. However, the use of aquatic physical therapy for younger patients with orthopedic or sports injuries has become more popular over recent years. 1. It provides accommodating resistance to functional movement patterns. • Resistance is determined by the individual: The faster the movement in water, the greater the resistance. • One can increase the resistance to movement by increasing drag with the use of devices that attach to the upper and lower extremities (Figures 1 and 2). • Functional movement patterns such as swinging a stick or simulating a tennis stroke make water a great environment for exercises. • By moving a limb through water, the motion of the water serves to assist the motion being performed. 4. The hydrostatic pressure of the water can help decrease swelling and edema. • The reduced stress which occurs when exercises are performed in water allows an athlete to return to certain activities earlier in the rehabilitation process which benefits them both physically and mentally. 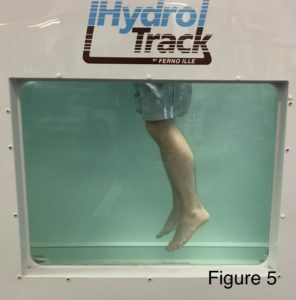 • Athletes frequently are concerned with loss of strength and speed during rehabilitation from an injury and use of aquatic therapy can help the athlete maintain endurance while protecting their joints and injury site2. 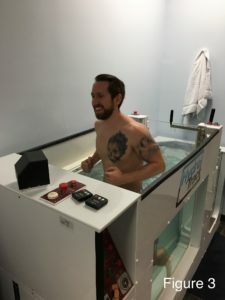 How do some conditions benefit from aquatic therapy? 1. Upper and lower extremity can lead to functional limitations including loss of range of motion, strength, and motor control4. 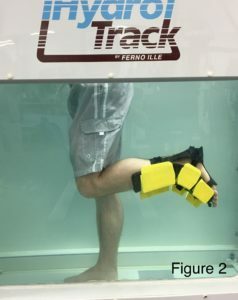 • Rehabilitation extremities in water can reduce the compressive and tensile forces on a joint while at the same time providing heat to increase flexibility4. 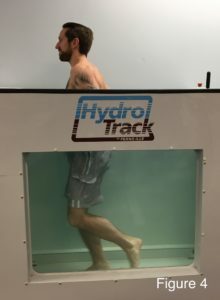 The Sports Rehabilitation Center has implemented aquatic physical therapy rehabilitation practices into patient’s plan of care to decrease the time required to return to prior level of function and increase success rates following injury. Depending on location, a pool or an underwater treadmill can be used for treatment. Patient with injuries ranging from arthritis and low back pain to ACL and rotator cuff repairs can benefit from therapy in the water. Following an initial evaluation, the therapist will determine how to best incorporate water therapy, if appropriate. Aquatic therapy will be used in conjunction with dry land treatments including exercise and manual therapy. Aquatic therapy may even be prescribed as part of your home exercise plan if you have access to a pool outside of the clinical setting. 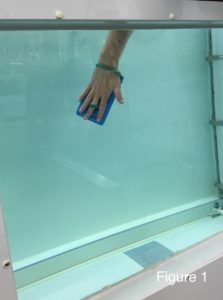 For more information on aquatic rehabilitation, call any of the Sports Rehabilitation location and visit our aquatic rehabilitation page on our website. 1. Becker, BE and Cole, AJ (eds). 2011. Comprehensive aquatic therapy, 3rd edition. Washington State University Press. ISBN 978-0615365671. 2. de Brito Fontana H et. al. Effect of gender, cadence, and water immersion on ground reaction forces during stationary running,” J Orthop Sports Phys Ther2012;42(5):437-443, Epub 8 March 2012. doi:10.2519/jospt.2012.3572.